LOSING LEBRON examines the impact of NBA star LeBron James' decision to leave the city of Cleveland. Told directly through the eyes of the fans he left behind, the film follows why sports are so important to their city. 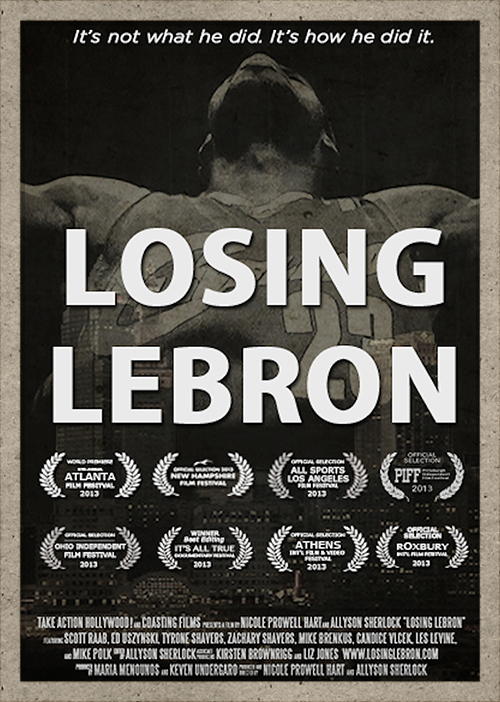 "Prowell Hart and Sherlock have done an excellent job..."
​LOSING LEBRON is a feature-length documentary that examines the impact of NBA superstar LeBron James’ decision to sign with the Miami Heat on the city of Cleveland. Told directly through the eyes of the fans he left behind, LOSING LEBRON follows three families during their first NBA season without LeBron James playing for the Cleveland Cavaliers. The film explores how residents have been affected by this move, why sports are so important to their city, and how this wounded community is working to redefine itself in light of the loss. Starring Scott Rabb, senior writer for Esquire Magazine and author of The Whore of Akron; comedian Mike Polk, Tyrone Shavers, Zachary Shavers, Mike Brenkus, and Candice Vlcek. Executive Produced by Maria Menounos, Keven Undergaro, and Take Action Hollywood! Directed and Produced by Nicole Prowell Hart and Allyson Sherlock.